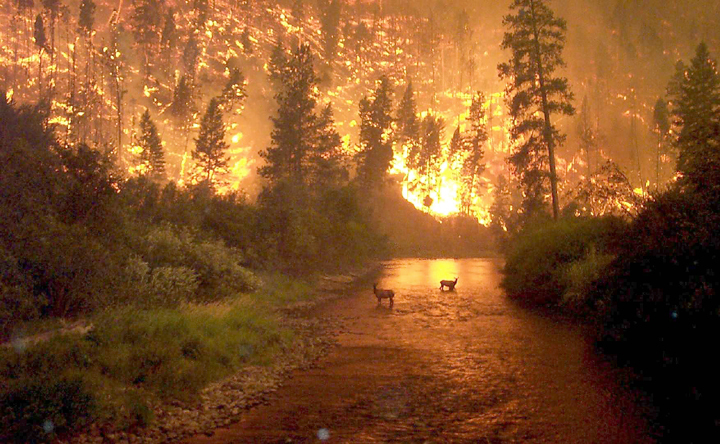 Wildfires may seem like a fixed and unchanging force of nature. They're not. Over long time scales, research has shown that both the climate and humans have a profound effect on wildfire activity around the globe. Now new NASA research shows that while we have been suppressing this natural force for the past century, we may be, inadvertently, about to put nature back in control. Charcoal layers in sediments and methane concentration in ice cores show that the amount of global burning can fluctuate dramatically over time. The charcoal records, derived from lake sediments and peats at hundreds of sites around the world, show a distinct lull in burning from about 1600 to 1750 that leads into an unprecedented surge in fires beginning around 1800. 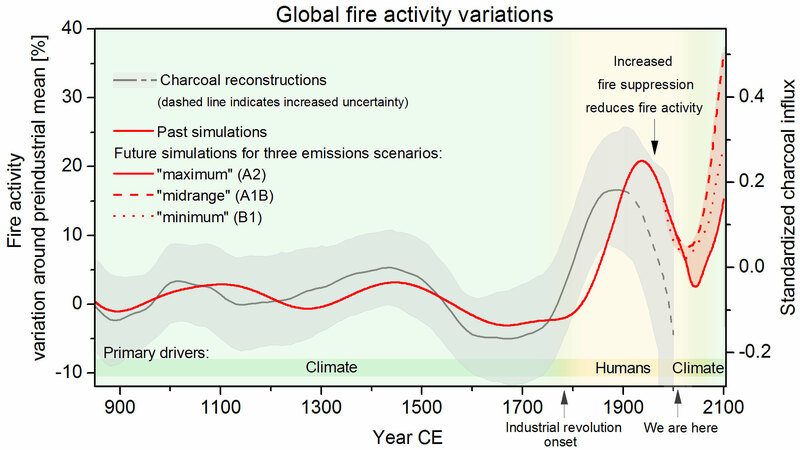 Then, around 1900, global fire occurrence begins a rapid decline that continues until the present. What drives such powerful swings in wildfire activity? And what do such trends bode for the future? Wildfire experts have long suspected that the vagaries of the climate — especially changes in temperature and moisture — govern wildfire abundance. Yet, parsing out the impact of humans — who have a knack for both igniting and suppressing wildfires — has made answering such questions difficult. NASA researchers Olga Pechony and Drew Shindell believe they have finally started to provide solid answers with the help of a new wildfire model that has produced the first long-term history of global burning. Their new wildfire model — which captures past trends well and offers predictions about futures trends — models global wildfires more accurately than previous models. Pechony and Shindell developed the model at the Goddard Institute for Space Studies (GISS) in New York City, and published a study this week in the Proceedings of the National Academy of Sciences based on its results. 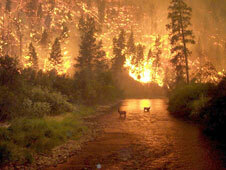 Pechony and Shindell's wildfire model is not the first or only attempt to model wildfires. Previous efforts have attempted to estimate fires based upon soil moisture, vegetation availability, and lightning trends. However, earlier models have only been validated at a few locations, and none have been validated globally against satellite records, which are the only source of consistent information about fires at a global scale. The narrative the model weaves is fascinating. Whereas variations in precipitation long dominated fire trends, the model shows that a dramatic population boom following the Industrial Revolution has made humans the primary force driving wildfire trends since the 18th century. "But now things are changing again," said Pechony, the lead author of the study. "Our projections show that our rising temperatures — this time driven by humans — are on the verge of reasserting control over the world's fires." If their modeling is correct — and it likely is given how well it replicates the last 1,000 years of wildfire history — climate change will have complex consequences for future wildfire trends. Pechony and Shindell predict just a modest global increase — about 5 percent — in wildfire abundance by 2100 if emissions continue unabated and population grows steadily, but they conclude changes from region to region will vary dramatically. 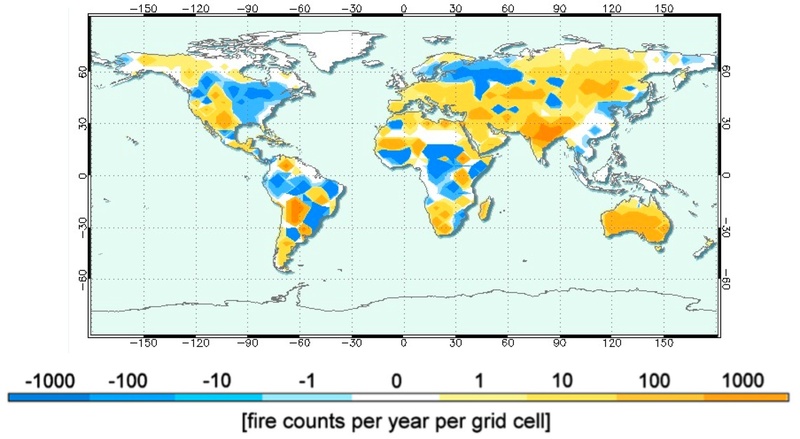 The new fire model predicts large increases in fire activity in India, Australia, central Asia and Siberia, southern Europe, and southern Africa. However, it also foresees significant decreases in fire activity in northern Europe and equatorial Africa and South America because of increased precipitation in those areas. Likewise, by 2100 it predicts more burning in a drier western United States, and less burning in a wetter eastern United States (though wildfires are already quite rare in the eastern United States due to the moist climate). Fire frequency has already increased in the western United States during the late 20th century, and the future projections show further increases of about 30 to 60 percent in that region. Global average fire abundance has decreased significantly since 1900 as technological advances in fire-fighting — particularly planes and flame retardants — have become available. By 2050, according to the model, global warming will have reversed that steady decline, and the global climate will again become the primary driver of fire abundance worldwide. 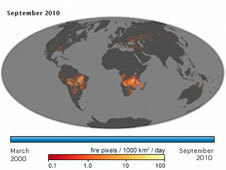 Unlike other wildfire models, the GISS scientists used data from numerous satellite instruments to validate their model. Its precipitation data, for example, comes from the Global Precipitation Climatology Project (GPCP) that combines data from several spaceborne instruments and rain gauges. Its estimates of vegetation — critical wildfire fuel — come from data produced by NASA's Moderate Resolution Imaging Spectrometer (MODIS) instrument. 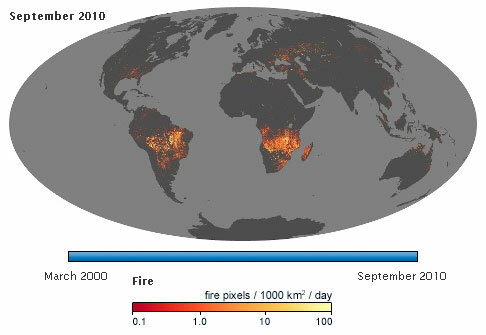 Its fire activity data was based on information from MODIS, Visible and Infrared Scanner (VIRS) and the Advanced Very High Resolution Radiometer (AVHRR), an instrument that has flown on multiple satellites. It used lightning data collected by the Optical Transient Detector (OTD), aboard the MicroLab Satellite. As a result, it produces results that replicate the modern distribution and the historical record well. Just like the historical charcoal record, for example, the model produces an increase in fire activity during the late 15th century — a period that was cold and dry due to a slow-down in solar activity. No model is perfect, both Pechony and Shindell emphasize. There are a number of assumptions on human-fire interactions, for example, in the model that will surely be refined as better data becomes available. And there are some areas where the model does not conform as closely to the historical record as Pechony and Shindell would like. Still, it represents a major step forward in wildfire climate modeling as this is the first time any scientist has reconstructed the causes of a thousand-years of fire history. "This is an important study," said Paulo Artaxo, a professor at the University of Sao Paulo and an Amazonian wildfire expert. "The shift from human-driven fires in the recent decades to climate-driven fire activity is very important. It will add even more carbon to the atmosphere, something which may intensify the cycle of warming and burning going forward." Pechony, O., and D.T. 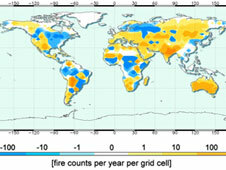 Shindell, 2010: Driving forces of global wildfires over the past millennium and the forthcoming century. Proc. Natl. Acad. Sci. , in press, doi:10.1073/pnas.1003669107. This article was originally prepared by Adam Voiland as a NASA Portal Looking at Earth feature.